The mission of Business for Peace is to support, inspire, and recognise the global business leaders who are positively changing the face of business. At the center of the Foundation’s efforts is the annual Business for Peace Award. Each year, recipients are selected by an independent committee of Nobel Prize Laureates in Peace and Economics in closed-door meetings. The Award is conferred annually to the exceptional individuals who exemplify the Foundation’s concept of being businessworthy: ethically creating economic value that also creates value for society. Past honourees have hailed from The Americas, Asia, Africa, and beyond, and represent leaders of industries as diverse as the head of a multinational baking enterprise in Mexico to the CEO in a company that is a key driver of the sustainable transport revolution. Winners of the 2019 Business for Peace Award will be announced on 20th of March and will be celebrated in a public ceremony in Oslo City Hall on May 15th. 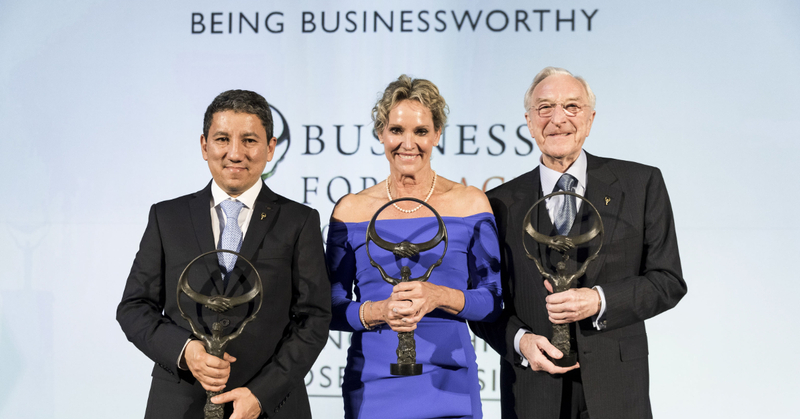 We welcome you to read more about our Award Criteria, the Business for Peace Award Committee, and the remarkable leaders who are previous recipients of the Business for Peace Award. The Business for Peace statuette is made by the sculptor Bruce Naigles. Read more about him on his website and an interview with him on making the statuette, done by Hélène Kolmodin in ICC.